In February 2004 I saw a 1965 Apollo 5000 GT basketcase being offered on eBay. 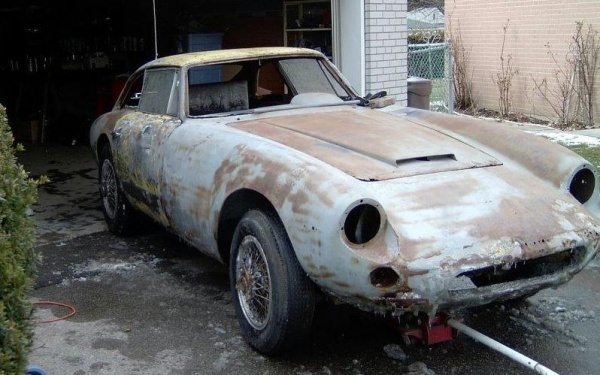 The photos showed a partially primered body which had suffered from a number of accidents and had significant rust damage as well. The description indicated that the right side door had been severely damaged and repaired in a very amateur way. The car was missing both seats and most of the interior. The engine/trans were strapped in with trailer tie strap and the rest of the parts were in a bunch of boxes. Just to top it all off, the floors had been cut away and replaced with a very poorly designed substitute made of galvanized sheet. All in all, a total wreck requiring a total ground up restoration and some pretty fancy metalwork. That was the bad news. 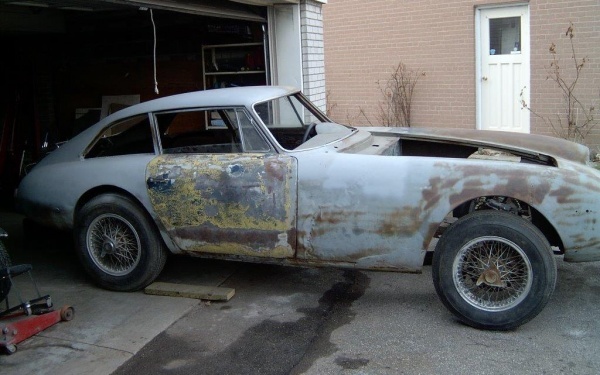 The good news was that all the necessary parts unique to the car, one of 88 built, were all there, albeit in rough shape, and that the seller was willing to deliver the car to anywhere in the Continental U.S. free of charge. In a moment of weakness (madness?) I bid the minimum amount and waited for the auction to play out. 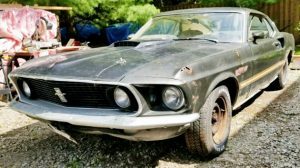 Seven days later, I was the proud owner of this very rare basket case and true to his word, the seller delivered the car from Texas to Northern Michigan where I took over and trailered my new beauty home to Toronto, Canada. So far pretty standard stuff, other than the rarity of the car, but it was going to get a lot rarer. 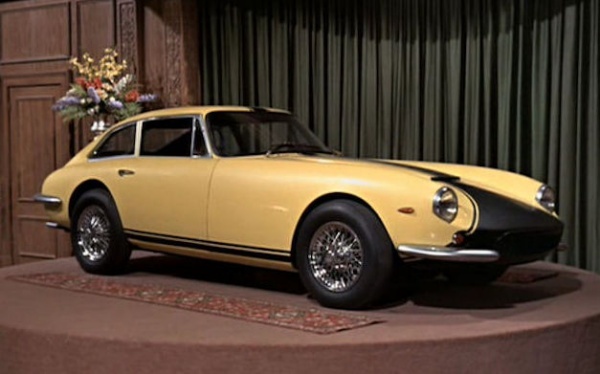 While researching the Apollo GT story, I found that a yellow Apollo GT was driven by the villain, Peter Thorndyke in the 1968 Disney movie The Love Bug. Thorndyke, driving the Apollo (named the Thorndyke Special) used every dirty trick in the book to defeat the little VW Bug. There was oil dispensed from the back of the Thorndyke, there were numerous collisions and near misses and there was even a grizzly bear in one scene. This was, of course, all done before the advent of computer generated graphics. I finally got a copy of the movie and sat down one night to watch it. About halfway through the movie I began to realize that many of the areas of collision between the VW and the Thorndyke Special corresponded to the damaged areas of my basket case Apollo. Could it be? Subsequent research confirmed that I was, in fact, the owner of the Thorndyke Special, co-star of The Love Bug. So much for painting it maroon. Disney Studios had contracted Max Balchowsky about preparing two Apollo GTs for the filming of the movie. He also supplied a number of other cars that were used in the various racing scenes throughout the movie. Balchowsky had performed extensive modifications to the engine, suspension and brakes of the stunt car that was used for the driving/collision scenes. These mods were instrumental in helping with the identification of my car. Restoration crawled along at the usual snail’s pace. The damage to my car after eight on-screen collisions were extensive and required the work of a highly skilled panel beater to rectify. The rest of the restoration required many, many hours of research and hard work to finish the car and to “get it right”. 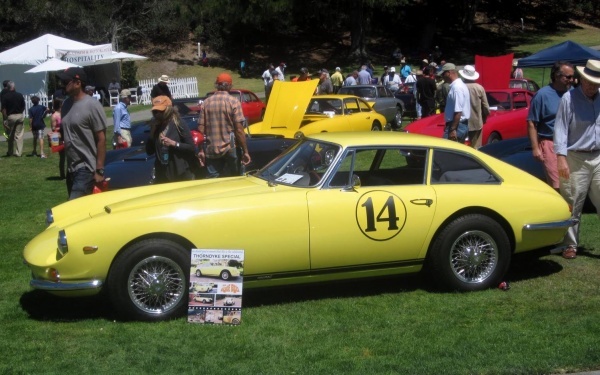 Fast forward to August 2013 where I was driving the ‘Thorndyke Special’ across the stage at Concorso Italiano where I joined 17 other Apollo GTs, which represented 20 percent of the total production, for the fiftieth anniversary of the Apollo. 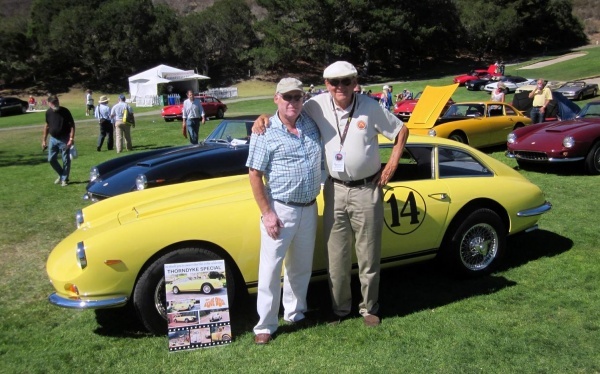 Also being honored were Milt Brown, the creator of the car and Ron Plescia who did the initial design work on the cars, later refined by famed Italian designer Franco Scaglione. Also in attendance was George Finley, who was Apollo’s sales manager in the day and Paula Reisner, widow and partner of Frank Reisner, founder of Intermeccanica, the coachworks in Turin Italy that built the bodies for the Apollo Gt. What a fascinating journey, the high point of which was taking an enthusiastic Milt Brown for a test drive around the boundary road that runs around the Concorso Italiano display area and then engaging in a 45 minute tech session with this wonderful man who had created this car fifty years ago. Nine years and many thousands of hours later was it worth it? Absolutely. Was it a Barn Find? 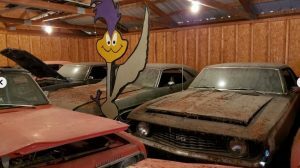 Yes, the pictures posted on eBay showed the car in a barn. Would I do it again? In a heartbeat! In fact, I have just bought another car built by Intermeccanica, and you guessed it, it’s in a barn! Thanks for sharing this story with us John! What a surprise that had to be to discover that your car had appeared in one of the most iconic films ever made! It sounds like it was a tough, but rewarding experience. 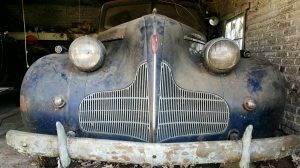 We are glad that you were able to save this special car from an uncertain future and please keep us updated on your new project. That’s really cool! Now all you have to do is find a gray sunroof Bug and add stripes to complete the display! To me the most amazing part of this is that the car survived at all. I would have thought that a movie car with that much damage back in the 1960’s would have been scrapped by the studio. ~ fortunate find! the seller must be kicking himself. i would love to see and read of the mechanical details!
. edit feature – GREAT! well done. the side windows look oddly familiar ( MGBGT ). This is fantastic! What a find! I’ve been a fan of the Herbie movies since I was very young. Thanks for bringing this beauty back to life! I would suggest adding the black vinyl in the front if you want to go the extra mile, but you’ve done plenty already! What do you have in the way of cheap, honest transportation? Cheap honest transportation indeed! Great story! I haven’t seen that movie since I was young– I remembered the villain’s car as being a Jag XK-E. Thanks for setting me straight! This must be one of the most unusual and unlikely outcomes in the history of the car hobby. 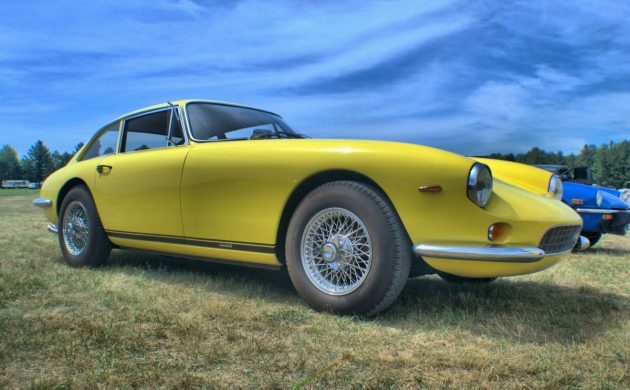 What are the odds that someone will buy a beautiful but beat up (semi-) exotic that never sold in big numbers and didn’t last very long in the market, and then find out that the exact car he bought was famous by watching a vintage movie? Truly amazing. 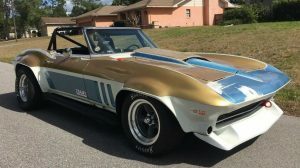 John B. has all kinds of reasons to be pleased with his purchase and to think that the cost of the restoration was well worth it. Heck, just to meet the principals of the Apollo, talk to them, and have them tell you the details and history of your car is worth the price of admission. BTW, some old timers might remember that Max Balchowsky, who prepped the Apollos for the movie for Disney, was famous for building the Old Yeller I and II race cars in the 1950s. He was a true god-like figure among hot rodders, partly because his cars took on some of the greats back then, for example, one Carroll Shelby driving a Maserati 450S. Max B. had some familiarity with fast cars, which makes John B’s car even more special. Thought I’d heard of his name before. 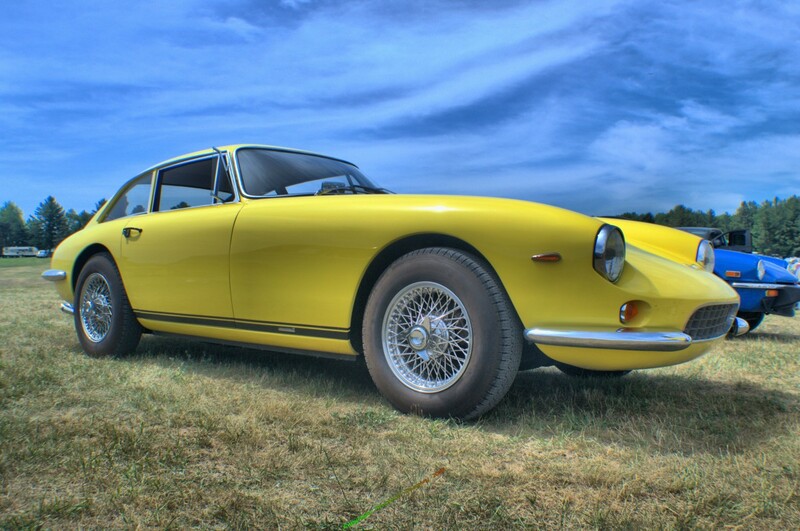 Wasn’t Old Yeller some sort of crusty old Ferrari beater? Don, as I remember the Old Yellers punched way above their weight, being that they were really just hot rod racers fabricated by a very skilled hot rodder who wanted to go road racing. I can’t remember the details, but I think they at least held their own against the big-buck European race cars back then. The least you could say is that the per-dollar performance of the Old Yellers was way above the expensive Euro cars. Max Balchowsky must have done a lot with Disney on the West Coast. He rented a Yenko Stinger I own from a previous owner for a Love Bug movie. Mine was just an extra with a couple of cameos though. This Appollo was a star! Cool car, cool history. What a great happy ending car story! The stories this car could tell? Go see the movie. And with one of the all time neat car guys, Max Balchowsky in the middle of it. Clever guy, he would run the Old Yeller racers with recaps(white walls at that)that he had pulled out of the mold before the rubber was completely hardened and vulcanized. The resulting soft compound tread wouldn’t last long but it sure was sticky. More pictures of the finished product would be appreciated. Like the engine and interior for starters. Max was a real character and liked to make people think his cars were just old heaps thrown together, using used, old, worn out parts and so on. So to carry on this elaborate scheme, like the story of the white wall recaps above (which I’d read about as well), he complained about a misfire in his Buick nail head engine. Made a comment to those standing around that, I can make it run better with spark plugs pulled from the trash can over there.” Then proceeded to dump the can over, dig through the trash tip he found some plugs. Put them in, went out and beat the competition. What no one knew was Max had placed a pack of new plugs in an old box at the bottom of the trash can early in the day! The legend and mystique continued on. 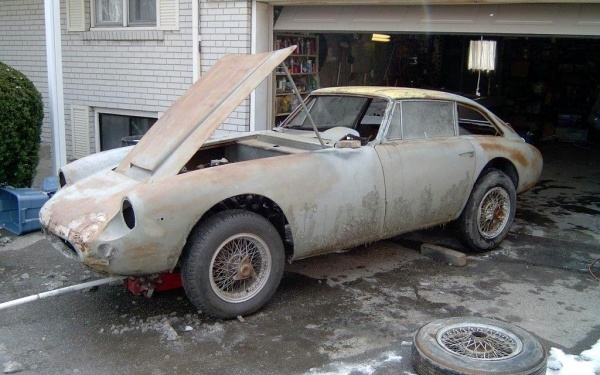 Great story about the Thorndyke Special; it found a proper owner. Congrats all around! Back when the Apollo came out along with lots of others both home builts and commercials, the hobby was about people that had love affairs with their cars, It WAS a great hobby, now SCCA and sports cars in general have become the toys of the affluent that buy race ready cars–with cup holders. I always wondered what kind of car the Thorndyke Special was! I finally Googled it and found out it was the famous Apollo GT. What a rare find…I’m a big Love Bug fan, even though I drive a Corvair, not a VW! I saw this car at the 50th celebration. The end result was great and it had lots of praise. There were about 19 of us displaying these rare and beautiful cars There were many visitors to the record setting display of the largest gathering of the Apollo GT. I drove my patina’d 1008 car to Concorso and I was the last to arrive. Even though 18 Apollo’s showed up ahead of me, they had directed me 60 yards into a classic Ferrari display before someone realized the mistake. Stop that’s an Apollo not a Ferrari. The price of these cars today? They are now in the 6 figure range. I am looking for a few high resolution photos of the Thordyke Special for a book I am completing. Does anyone have 600 dpi or above images that you would share? My dad had a auto repair shop in Huntington Park, CA, J and L Automotive in the 1970’s. I remember a customer buying one of the 1965 Apollo 5000 GT from WDS. My dad had it in his shop for months, working on it, when he did not have customer work. The car had over 27 coats of paint, primer and bondo. From what I remember all the close up shots were done and then they ran the car through hell. They would beat out the damage and paint over it and continue filming. The car came out perfect, you could not even tell it had been such a mess after the movie. Thank you, Jeff. A great follow up on an interesting car. I may have seen this car(could there be 2 yellow Apollo’s in this area? )at Mosport today. Honestly, I’d never heard of, let alone seen one up to this point, when it rolled past, I immediately though it was an E-type, but quickly thought something wasn’t right…I’m glad I took the stroll over to the show field to get a better look. Does anyone know how I can get a hold of John B. the owner? I own a screen used Herbie stunt car also featured here, and I’m working on an event for later in the year that I would like to invite John to bring the Special to.